Video excerpt from "Molten Paradise: Kilauea Volcano" a collaboration between HDNet television and USGS. The program aired between 2002 and 2012. In the video, USGS geologist Rick Hoblitt describes taking a lava sample from a lava tube skylight. This work took place downslope from Pu'u 'O" o vent on Kilauea Volcano, Island of Hawaii in 2002. As of 2013 the eruption continues and sampling is done every few weeks. Lava tube on the Mauna Ulu flank, Hawaii, United States. Hawaii Volcanoes National Park. 1972-1974 eruption of Kilauea Volcano. Scientist collecting pahoehoe on the south side of Alae Crater subsidence bowl. Photo by R.L. Christiansen, February 12, 1972. 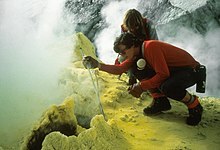 Sampling gases at a fumarole on top of Mount Baker, Washington. A volcanologist or vulcanologist is a geologist who studies the processes involved in the formation and eruptive activity of volcanoes and their current and historic eruptions, known as volcanology. Volcanologists frequently visit volcanoes, especially active ones, to observe volcanic eruptions, collect eruptive products including tephra (such as ash or pumice), rock and lava samples. One major focus of inquiry is the prediction of eruptions; there is currently no accurate way to do this, but predicting eruptions could alleviate the impact on surrounding populations. "Volcanologist" (or Vulcanologist) was derived from the English volcanology (volcano + -logy), which was derived from the French volcanologie (or vulcanologie), which was further derived from the French word volcan (“volcano”), which was even further derived from Vulcanus, the Latin name of the Roman god of fire and metalworking. The Latin word is of Estrucan origin, but unknown meaning. Volcanologists attempt to decipher what clues rocks leave behind about the inner workings and chemistry of the earth. While there are many exciting aspects to a volcanologist career, most assignments study the remains of either dead or dormant volcanoes. Volcanologists earn an average of $90,890 per year, with the highest 10% earning around $187,200 and the lowest 10% earning around $48,270. Most of these scientists work for different levels of government, universities, and private research institutes. Typically, Volcanologists split their workdays between conducting fieldwork and working in a laboratory. During fieldwork, scientists may be required to venture to exotic or isolated locations where active or dormant volcanoes reside. They must collect various samples and data, generally in an outdoor area. Those hoping to become a Volcanologist must be prepared to travel, spend extended periods of time away from home, perform strenuous physical activities, and brave adverse weather conditions. Once they have finished collecting samples, they return to their laboratory to analyze their data. They then must communicate their findings to a group of scientists. Volcanologists employed by universities may also be required to spend time in a classroom environment. Most of these scientists work full-time and may be required to work extended hours when performing fieldwork, which is quite frequent. The job demand for Volcanologists is expected to grow 16% in the next 10 years, which is faster than the average profession. The public's increasing interest in environmental protection, safety, and management will spur the upcoming growth in positions. Volcanologists require a bachelor's degree at minimum in geology, geophysics, or earth science. However, a bachelor's degree typically provides little specialized knowledge of volcanoes and will only allow someone to obtain an entry-level position in the field. Most Volcanologists possess either a master's or doctorate degree, allowing them to acquire more advanced knowledge of volcanoes specifically. Those wishing to be employed by universities or seek academic funding would be well served by earning a Ph.D. In some areas, becoming a Volcanologist that predicts the eruption of volcanoes may require a special license.